LAKE ODESSA, MI – June 1, 2018 – David Gravel powered from third on a restart to lead Lap 16 and went on to win the Rumble in Michigan at I-96 Speedway. Shane Stewart continued his streak of top-five finishes with a second place run and Brad Sweet, who stole the lead from Gravel only for it to be negated by a yellow, settled for third at the conclusion of the caution-filled Feature. Sheldon Haudenschild won the Sears Craftsman Dash and earned the pole for the 35-lap Feature alongside 1995 I-95 Outlaw winner Joey Saldana. Haudenschild paced the field early as Gravel quickly maneuvered into second around Saldana. While Daryn Pittman and Saldana battled for third, Donny Schatz got a run off the bottom of turn four and surged by both of them to take the position. After an Open Red on Lap 14, Schatz pounced on Gravel and stole the runner-up position before a caution for Gio Scelzi, who was running in the top ten, halted competition one lap later. 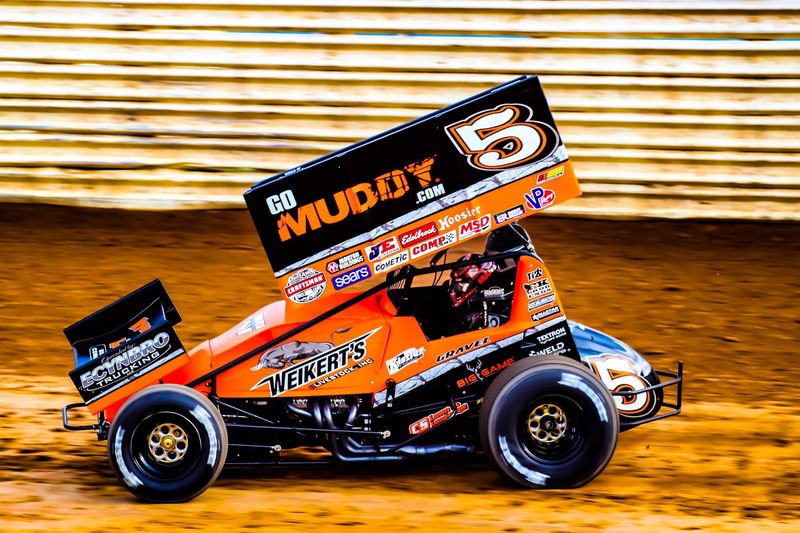 Haudenschild led the field back to Green once again, but this time with the nine-time Series Champion next to him and David Gravel inside the second row. Gravel entered turn one on the cushion and powered around Schatz before squeezing under Haudenschild to steal the lead going into turn three with a breathtaking move. Schatz slowed on the frontstretch the following lap with a flat tire and Jason Johnson clipped his left rear trying to avoid the Fargo, ND native and ended up getting upside down. Johnson was uninjured but done for the evening. Schatz was able to change his flat tire and return to the rear of the field. Gravel commanded the lead through a pair of restarts, before an off the pace Sheldon Haudenschild brought out the caution with six circuits remaining. Haudenschild, who slowed significantly, never stopped but was the cause of the caution and was sent to the rear accordingly. On the double-file restart, Brad Sweet got a massive run off the cushion and diamonded underneath Gravel to lead into three, only to see the caution for a backwards Cory Eliason negate the pass. Gravel controlled the ensuing restart and one more with two laps remaining to win his third World of Outlaws Craftsman Sprint Car Series Feature of the year and second in a row at I-96 Speedway. “I got a little lucky with the yellow coming out after Brad got me. It was tough to know what to do on the restarts and Brad got a good run and I tried to protect position, but that only hurt my exit and he got by me,” Gravel said in reference to the negated pass for the lead. “All those late restarts, you never know what’s going to happen. I just wanted to see the checkered. I’m just happy to get another win, this team deserves it. It’s our third win of the year, heading to a track (Wilmot) we love tomorrow,” Gravel added in Victory Lane in front of his CJB Motorsports No.5. Shane Stewart scored his third consecutive top-five finish and while he remains in search of his first victory of the year, Stewart and the Kyle Larson Racing No.2 team are confident. “Another great finish for these ENEOS guys, we have really turned our team around these past few races,” Stewart, who stole second from Sweet on the last restart, said. Sweet, who was in search of his second consecutive win, was in good spirits. “That’s racing, sometimes the cautions fall your way, sometimes they don’t,” Sweet said in reference to the ill-timed caution. “I should’ve got second, but I took one last shot at the win and gave up second to Shane. You never know if you don’t try,” Sweet added with a smile. Donny Schatz, in true championship form, came back from a flat tire at the halfway point to finish fourth. Brent Marks, who battled fuel issues all evening, rebounded in a big way coming from 22nd to complete the top five in his first visit to I-96. Marks’ effort earned him KSE Hard Charger Honors for the fifth time during the 2018 season. The World of Outlaws Craftsman Sprint Car Series treks to Wisconsin overnight to compete at the Wilmot Raceway Saturday evening for the Badger 40 before the Series tries again to make its inaugural visit at Fairbury American Legion Speedway with the FVP Platinum Battery Showdown on Tuesday, June 5. If you can’t make it to the track, catch every lap LIVE on DIRTVision.com!